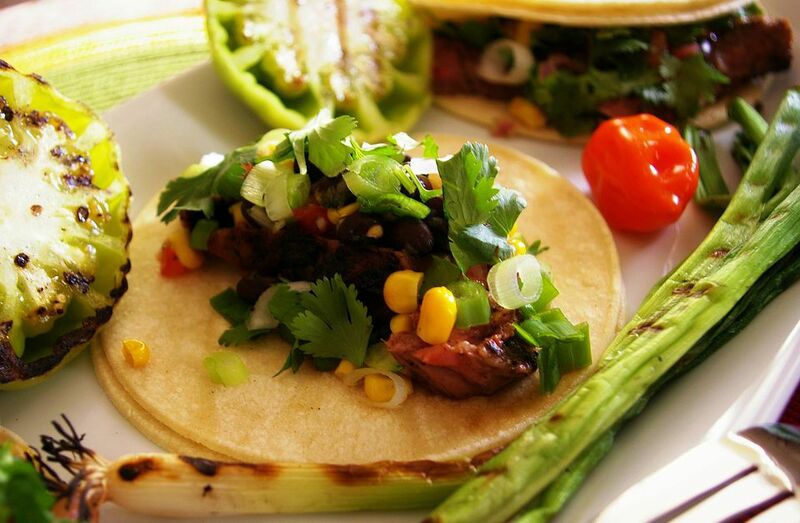 A well-balanced mixture of lime juice, garlic, onion, earthy cumin, and the deep richness of chipotle peppers, these skirt steak tacos are truly fantastic. We recommend grilling the meat over charcoal to really bring out the flavors. Place skirt steak in resealable plastic bag. Combine marinade ingredients in a bowl. Pour over skirt steaks, making sure to evenly distribute marinade all over the meat. Seal bag and place into refrigerator for 2 to 5 hours. If using a charcoal grill, you want a two layer fire, with the coals nice and hot. Place marinated steaks onto grill grate and cook for 3 to 5 minutes per side, with the lid off. Make sure to watch it closely as these steaks cook quickly. Once cooked through remove from fire and allow to rest for 5 minutes. Slice against the grain into thin strips, serve onto warmed tortillas, and top with corn salsa, sliced green onion, guacamole, and chopped cilantro.